Founded in 1996 in Berlin, Germany, J. MAYER H’ studio, focuses on works at the intersection of architecture, communication and new technology. Recent projects include the Town Hall in Ostfildern, Germany, Potsdam Docklands Masterplan 2002, a student center at Karlsruhe University and the redevelopment of the Plaza de la Encarnacion in Sevilla, Spain. From urban planning schemes and buildings to installation work and objects with new materials, the relationship between the human body, technology and nature form the background for a new production of space. 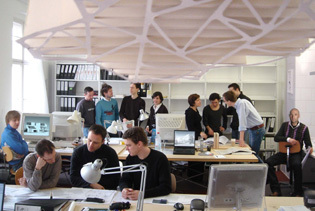 Jürgen Mayer H. is the founder and principal of this crossdisciplinairy studio. He studied at Stuttgart University, The Cooper Union and Princeton Universtiy. His work has been published and exhibited worldwide and is part of numerous collections including MoMA New York and SF MoMA.